You may like to bask under the brilliant and bright sunlight; or you may want to take a siesta during the afternoon; or you may want extra privacy. Regardless, a luxury home window treatment ensures that you get the enjoyment you want. You can take control of your windows and adorn your rooms with a scintillating selection of window covering as well as curtains and drapes. Not all luxury home window treatments will create the same décor. You will have to select the style which serves the purpose you are looking for. You have countless luxury home window treatment options to choose from: elegant sheer curtains, modern cellular and Roman shades, and more. You may even choose the natural wooden blinds or accessorize with curtains that have convenient sliding features at the bottom. You can also opt for thermal curtains that ensure heat stays during winter. 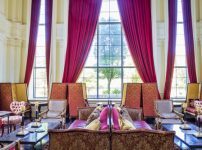 There is more to luxury home window treatments than just covering up the windows. Valances function as gorgeous decorations for your windows. You have options like lace jacquard panels, flowing waterfall valances, and voile scarves for dressing up your windows. You can transform your windows into exotic scenery. You can even accessorize with unique pelmets and curtain rods that feature intricate designs. 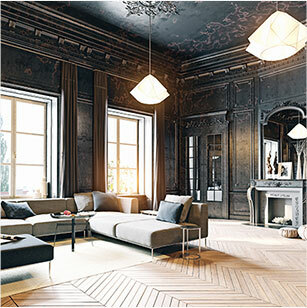 Roman shades are experiencing a renaissance in the luxury home décor. These shades are made from flat fabric pieces that fold like an accordion. The Roman shades effortlessly blend into the overall outlook of your rooms and can be easily dusted and kept clean. Another version is the blackout Roman shades which provide the same function of blocking sunlight as blackout curtains. You can accentuate the tropical charm of your home by choosing bamboo shades. Elegant and sophisticated linen shades or damask shades with tassels look regal and stately. When you are designing shades and curtains while undertaking a window treatment project, it is prudent to see that not all the shades and curtains are of the same style. In order to break the monotony, it is advisable to mix up your luxury home window treatment options. This move inspires you to step out of the box by mixing Roman shades on some windows with full length curtains, and more. There are no strict rules when it comes to luxury home window treatment. 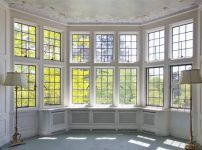 Some factors to consider include: the size of the windows, where the panels are to be hung (whether inside the windows, slightly above the window, or at the ceiling), and more. In addition, consider how much sunlight you wish to let into the room as it will affect the position of the valance in the room.